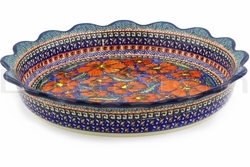 Stoneware Round Baker - as always with Polish Pottery, this handsome stoneware Baking Dish goes from the oven directly to the table keeping your food hot and beautiful! Heavy and versatile, this Round Baker is microwave, oven (up to 350F) and dishwasher safe, and is also chip-resistant and lead-free. The cleanup is easy - nothing sticks! For best results avoid sharp temperature swings: cold to hot or vice versa.